We’d love your help. 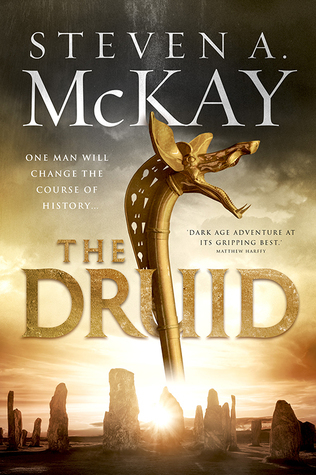 Let us know what’s wrong with this preview of The Druid by Steven A. McKay. "Steven A. McKay's archetypal villains and heroes step vividly onto the page from a mist-veiled past of legend to battle for the life of a princess and the fate of Britain. To ask other readers questions about The Druid, please sign up. When is the next Druid book due out?? When is book two due out? Escapism is the first word that comes to mind when I think of this book. You don't need to be familiar with the period to enjoy it, the plot is not overly complex, it doesn't keep you over thinking or flicking back through the pages to try and remind yourself what happened previously. It's just one bloody good romp from the get go. Bellicus is a Druid, and also a fine warrior. He is young and confident, tall and broad, well versed in the sword and not at all afraid to use it. He is also familiar Escapism is the first word that comes to mind when I think of this book. Bellicus is a Druid, and also a fine warrior. He is young and confident, tall and broad, well versed in the sword and not at all afraid to use it. He is also familiar with the country, has two dogs that can both hunt and fight, so when his king's daughter is kidnapped by Saxons, who else will the king rely on to go and fetch her back? So that is the basis for our story, with guest appearances from the said kidnapped daughter, a couple of Saxon raiders and their chief, a retired Roman optio and a couple of others along the way. And it is a damn good read. As I said above the plot is easy to follow, the descriptions of dark age Britain explained so well that there really is no conscious thought required, you just enjoy getting to know Bellicus and his hounds as they make their way ever south. There are, of course, a few bumps along the way, wouldn't be much of a story otherwise, and each bump brings with it a fantastically written fight scene in which our antagonist proves his mettle in battle. Merlin and Arthur even make a guest appearance, which surprised me actually, as it seemed to be completely out of the blue. The finale is both tense and well written, and really gives a feel for the magic of the old gods. I think there is much more to come from Bellicus, his character not quite fully fleshed out yet, it felt as if Steven is holding just a little back to add another layer to the rest of the books in the series, which is no bad thing. All in all highly recommended, and I look forward to the next one. When an author embarks on a new journey, a new set of stories and characters, it is a somewhat risky proposition. Can the author carry over the same creativity, the same character development, the same blend of historical authenticity and believable fiction. In The Druid, Mr. McKay has successfully ticked all of those boxes. It is at once a thrilling adventure, a romp through a volatile period of Britain's history, but it is also a character driven tale. Bellicus is a complex man; a warrior, a healer, a teacher, a bard, a spiritual leader in an age where his kind are on the decline. The task awaiting him tests all of his abilities and his emotions as events unfold. One of the features I enjoyed was the inclusion of Merlin (or, more correctly The Merlin), and Arthur as important bit characters. Stripped of the more mythical renderings, they are more down to earth, so to speak. The Druid is a brand new tale for the author, this tale follows Bellicus. Religion is changing but Druids still hold some power..and as such when the King’s daughter is take You should know who Steven A. McKay is..author of the Forest Lord series based around one of the best historical figures ever in my mind Robin Hood..after what seemed like forever the end of the series came hard like a punch to the gut.. I needed more.. but could the author ever live up to the expectations set..well lets see. If a person looks at a good book and thinks of it as a glass of fine wine, Steven McKay's latest effort is a glass of fine, sparkling champagne. Yes, this is the same Steven McKay who authored the "Forest Lord" series about Robin Hood, putting his own twist onto that time-honored story. Now, he tackles the historically (at least by Hollywood script writers) much-maligned druids who have been shown to be bloodthirsty cannibals engaging in human sacrifices and then having them for dinner. As anyon If a person looks at a good book and thinks of it as a glass of fine wine, Steven McKay's latest effort is a glass of fine, sparkling champagne. Yes, this is the same Steven McKay who authored the "Forest Lord" series about Robin Hood, putting his own twist onto that time-honored story. Now, he tackles the historically (at least by Hollywood script writers) much-maligned druids who have been shown to be bloodthirsty cannibals engaging in human sacrifices and then having them for dinner. As anyone who has studied any history can tell you, the druids evolved from that early incarnation into a respected religious order, holding true to the gods of old despite the rise of Christianity in Britain. And, that's the type of druid the hero of this story - Bellicus -happens to be, and just for fun, let's make him a warrior and fighter as well. Throughout English history there have been certain characters about whom people have asked, "were they real?" There is of course, Robin Hood and the other is King Arthur, who makes an appearance in this work and while he may or may not have existed, he plays an integral role in this tale. Without giving away too much of the plot, Bellicus is on a mission to rescue the daughter of another one of those English characters mentioned previously, King Coroticus (or Caraticus as some spell it). It seems she has been kidnapped by those nasty Saxons who keep popping up in every book set in early Britain at the behest of their leader, Hengist, yet another character who pops up frequently in books set in this period. Obviously, the adventures of Bellicus as he sets off to rescue the young lady form the basis of this action-packed novel which has enough blood for those who like a lot of blood-and-guts and perhaps a bit too much for those who don't. It isn't over done, so not to worry. Does Bellicus succeed in his mission? How does Stonehenge fit into this tale? How does Arthur and Merlin, his druid, fit into it? To find out you have to read the book. And it's sequel which is being written. Steven A. McKay, author of the Forest Lord series about Robin Hood, tries his hand at a new character and a new time period with The Druid. It's McKay's custom to deliver lots of action in his novels and The Druid is no exception. I think this may be his most action-packed novel so far. There are battles, raids, duels, skirmishes and chases throughout and the pacing of the novel reflects this; it's a fast-moving read. As for the druid himself, Bellicus, McKay has created a strong protagonist who Steven A. McKay, author of the Forest Lord series about Robin Hood, tries his hand at a new character and a new time period with The Druid. As for the druid himself, Bellicus, McKay has created a strong protagonist who arrives fully-formed, trained, battle-ready and with a strong skill-set, but, as the novel shows, with plenty of room for development and character growth. He also has a spirituality that matches his profession as a druid. Aside from Bellicus, McKay also develops a cast of interesting supporting characters on both sides of the story's conflict. The world of post-Roman Britain as devised by McKay is a dream setting for action stories. There are few definitive written records of the period and historians put forth multiple possible theories about what was going on at the time, leaving an author almost a free hand at invention. With the political and military rivalries of the Picts, the Dalriadans, the Alt Clotans, the Saxons and the Britons of the southern kingdoms, not to mention the religious rivalries between the Old Way of the Druids, the Christians of the south, the pantheon of the Saxons and even the vestiges of pagan Roman worship, there's plenty of conflict to generate great stories. As I was reading, I observed plenty of material here to generate sequels that could keep Bellicus busy for quite some time to come and I'm sure McKay has plans. The druid order itself is explored believably based on what little I've read of Celts and druids. The idea that they are part-bard and part-priest is effectively developed within the framework of the story. We meet other members of this order, not just Bellicus, and these examples effectively demonstrate their place in their society. I'm not sure that real druids were warriors, but there's no reason a druid couldn't be as skilled as Bellicus following the manner in which the story suggests. The reasons for his war-training may be hidden in the character's mysterious past which I suspect will be mined in future instalments. I heartily recommend this adventure from Steven A. McKay--I think it's his best novel yet--and I want to congratulate him for starting a new series which looks like it has the potential to outgrow and outshine even his successful Forest Lord series. Thoroughly enjoyed this tale, well up to earlier standards; I look forward to the next in the series. I hope Catia is not too badly scarred by her experiences! Good, fast-paced adventure. A man-on-a-mission yarn that put me in mind of a western transplanted in Post-Roman Britain. Plenty of action and good period detail as well as an interesting protagonist. Seems to be the beginning of an exciting series. I have read other books by this author and I knew that I would not be disappointed at all. The characters are wonderfully described and the story won’t disappoint you at all. I highly recommend this book to everyone. If you've come across Druids in Historical Fiction novels before - old, vague, talking in 'riddles,' calling grown, bearded warriors 'my child,' wearing long white robes and mistletoe - forget them! Because Bellicus, the Druid at the heart of Steven's new series, is nothing like anything you've read before. Bellicus is big, huge in fact. He wears a brown robe, and he's young, just twenty-six. Yes, he sometimes has a beard, but it is not white, or even grey - though it migh If you've come across Druids in Historical Fiction novels before - old, vague, talking in 'riddles,' calling grown, bearded warriors 'my child,' wearing long white robes and mistletoe - forget them! "A group of Saxon raiders held no fear for him." The story begins in the kingdom of Alt Clota, ruled by King Coroticus. Alt Clota and the great fortress of Dun Breatann seems to have been located around the area of the Antonine Wall, as was, modern Strathclyde (which I know from my reading wanderings through Viking history. played a huge part in later Viking Kingdoms in the East of Britain and Ireland). The King's daughter, Catia, has been captured and spirited away, for reasons unknown, by ruthless, savage Saxon warriors. The Druid then, is about the chase Bellicus sets out on, and the tortuous quest he has to make in pursuit of his King's only daughter and her captors. We travel south, over Hadrian's Wall, then deep into the heart of Dark Age Britain, physically and mentally. To the ancient, beating, bleeding heart of Britain, at Stonehenge. It is a place where strange rituals once took place, still take place on moon-lit nights, and where the spirits of the long dead victims are said to walk the land on certain, terrible occasions. Why Stonehenge, why Saxons, and the rest of why this book is so fantastic, you'll have to find out for yourself. In the meantime...I don't know any druids, I've never met any druids and as far as I know, no druids have ever met me. However...this druid feels much more realistic, than the druid you will, for instance, meet in James Wilde's Pendragon series - if you don't want to punch him in the face after two pages, then check your pulse, you may have died. Bellicus even acknowledges the actual powerlessness of his 'power.' He knows it is one that is in reality, based on trickery (just like the tricks that worked so well some 400 years earlier, for a simple, illiterate, nobody in the Galilee area. Why do you think poor people flocked to free exorcisms?). The quest Bellicus is on is also, as the introduction at the top of the post says, an chance to look at several parts of the immediate post-Roman age Britain. Obviously, a lot of British society was thoroughly Romanicised when the legions left, and the arrival of the seemingly lawless and culture-less, Saxon invaders, just emphasised the black, barbarian hole their previously ordered lives seemed to be falling into. The Druid, with some finely worked, illuminating (!) details about Dark Age Britain, looks at how, in many areas, people felt they were abandoned, but had set about starting again, from year zero. For good or bad. Ordinary people are struggling to make sense of their new, constantly changing world, and falling back on the only stable, or constant, parts of their lives - the change of seasons, the need to eat, life and death, their old gods, and each other. And in the face of the rampant changes in waiting from the new religion of the White Christ, we can see how their druids could also offer at least a semblance of much needed spiritual stability as well. As well as a battle axe, in Bellicus' case..
What is even more stunning than the inspired character of Bellicus, is the quality of Steven's new writing. The Forest Lord series was very good indeed, this is better all the way round - substantially better. How? I can't analyse it properly, I can just state what I feel. It feels bright, clean, unencumbered, yet in no way stripped-down. Confident, straight-ahead and vivid - instantly engaging storytelling on a par with anything you've read before by him there Cornwell, or Kane, or Kristian (I'll also throw in a 'Harffy,' if he sends me a physical copy of his next book...). You need to buy The Druid, read it, savour it, hug it and buy it again if necessary - just do it now! Having enjoyed steven mackays forrest lord series i was eager to start this new series and i wasn't disappointed. We follow a warrior druid as he sets of to return a young female hostage abducted by a saxon war band. No spoilers but it is a good tale and a exiting start to this new series. Recommended. With the forest Lord series Steven A McKay gave us a barnstorming version of Robin Hood, now he moves further back in British history to a time just after the Romans have left and the Old ways are starting to make a comeback and the Britons are desperately fighting off the Saxons. The Druids despite being decimated by the Romans play a big part in this and one Druid in particular Bellicus a young giant of a man, a commanding presence wise beyond his years with Druid lore and an almost preternatu With the forest Lord series Steven A McKay gave us a barnstorming version of Robin Hood, now he moves further back in British history to a time just after the Romans have left and the Old ways are starting to make a comeback and the Britons are desperately fighting off the Saxons. The Druids despite being decimated by the Romans play a big part in this and one Druid in particular Bellicus a young giant of a man, a commanding presence wise beyond his years with Druid lore and an almost preternatural skill with the blade. The kings daughter has been taken and Bellicus is charged with her safe return.... with his two trusty warhounds at his side this just what he sets out to do. I did enjoy this book.. Though like his Robin Hood Series I had to first suspend some disbelief. The Druid in Question is in his 20's and yet he id chief Druid to a major king.. and he he can fight like no other warrior.. the way he dispatches a Saxon champion is quite fantastical. Also there is an ex centurion who was only 19 when a centurion.. now a portly baker. but who turns again to hard muscle in a few days.. But putting these tings aside it is a good intro to further stories.. We meet Arth I did enjoy this book.. Though like his Robin Hood Series I had to first suspend some disbelief. The Druid in Question is in his 20's and yet he id chief Druid to a major king.. and he he can fight like no other warrior.. the way he dispatches a Saxon champion is quite fantastical. Also there is an ex centurion who was only 19 when a centurion.. now a portly baker. but who turns again to hard muscle in a few days.. But putting these tings aside it is a good intro to further stories.. We meet Arthur and Merlin in this tale.. and I wonder if that is how this tale will develop rather than centre around the Druids home in the north of the country. I have enjoyed reading and following along with Bellicus, the Druid, as he tracks down, Catia, the young Princess who is abducted by the foreign Saxons because of her magical and royal blood. Through the imposing druid's journey, he crosses path with Merlin and Arthur as they are getting ready for a major battle. Bellicus and Merlin talk about how the old ways were being incorporated into the new Christian religion threatening their culture and traditions. Fast-paced novel set in the unique post-Roman, pre-Viking time period. As the Saxons push to claim the land of the Britons, the land is ripe for war & conquest. A bold move sets in motion the chase. Well developed characters, details of the landscape, and interesting descriptions of the rituals and lifestyles makes for a well done story. If you like the dark ages of Britain’s history, then this book is for you. A well spun story with likeable characters and a plot line that surprises and delights. It transported me into the mysteries of that age and left me wishing the next book in the series was available today. Mckay really hits his stride with this one. Being "Dark Age" Britain he embraces the little known historical facts we have about the era and creates a diverse, personal, and relatable character who takes on adversity from outside influences as well as internal hardship. He's really got a good story unfolding, and I look forward to the next installment of the series. This is a great book. The characters are well developed and the flow of the book is good. The only reason I gave it only 4 stars is that there were far too many open story lines so the reader would not be satisfied just reading this book but feel that they have to move on the next book in the series. Excellent start to new series. Forest Lord was an excellent series that was very unexpected. Angus Donald would have been proud. This is more Skystone than traditional Robin Hood. This book held my interest from page one. This period in time contains much magic and wars from long ago. The druids are not documented due to lack of facts. It was a wonderful view of their society. Truly loved this story about the past. Filled with all a Druid was as he sought to fulfill a mission only a Druid could complete. Faith was with him always. This book needs to be read by any history buff tired of textbook banality.